Is there any happier sight than a grown man high-fiving the Michelin mascot? Corvette Racing made history with not only their 100th win as a team over the weekend, but their 60th 1-2 finish, largely by staying out of trouble during the contact-heavy WeatherTech Sportscar Championship race at Lime Rock Park. The two hours and forty minutes of the race itself were characterized by heavy contact, with three classes—GTLM, GTD and PC—packed onto the short Lime Rock Park road course. Eventually, the No. 4 Corvette of Oliver Gavin and Tommy Milner made it through to first at the very end after Giancarlo Fisichella ran off course in the Turn 1-2 complex in the leading No. 62 Risi Competizione Ferrari 488 GTE with only 31 minutes to go. Fisichella ran wide at Turn 2 just four laps later, letting the No. 67 Ford GT and the No. 3 Corvette through. With twenty minutes left, Antonio García passed the No. 67 in the No. 3 to claim second place for Corvette. García finished a mere 0.975 seconds behind his teammate. 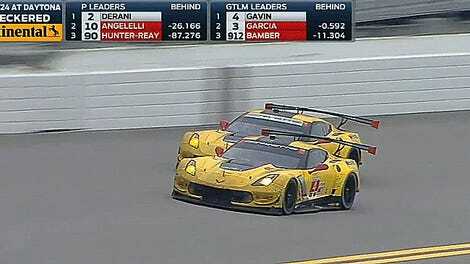 It’s like these Corvette drivers have won an endurance race before or something. Maybe 99 of them. Now it’s 100. That’s 100 races, for arguably the most American car out there by far: a big, rowdy yellow V8-powered Corvette. If there was ever any doubt that America is great, just look at this car and have it do the best sounding celebratory donuts you’ll ever hear. As for that guy in the Bibendum suit—you’ve got to keep your eyes on him. He’ll sneak up behind you in no time like a big puffy tire-pushing ninja.